37 companies currently qualify for inclusion, with 23 filing in U.S dollars and 14 in the Canadian currency. Since our last report in mid-November, we added Acreage Holdings (CSE: ACRG) (OTC: ACRZF) and recent IPO Plus Products (CSE: PLUS). Note that we have included the reported revenue for Acreage Holdings, though the company provided a pro forma number above $20 million. GW Pharma (NASDAQ: GWPH) fell off the list this quarter due to its not achieving sales of $2.5 million in its fiscal Q4. Based on consensus estimates in excess of $9 million, the company should return in February, when it reports its fiscal Q1. We expect to be adding several additional companies over the coming months as existing public companies continue to ramp up sales and as others begin to trade publicly. In addition to quarterly reports from Acreage Holdings and Plus Products, KushCo Holdings (OTC: KSHB) reported its fiscal year ending August 31, and we received quarterly reports from Charlotte’s Web (CSE: CWEB) (OTC: CWBHF), Curaleaf (CSE: CURA) (OTC: CURLF), Green Thumb Industries (CSE: GTII) (OTC: GTBIF), Harvest Health & Recreation (CSE: HARV) (OTC: HTHHF), MedMen Enterprises (CSE: MMEN) (OTC: MMNFF), MJardin Group (CSE: MJAR) (OTC: MJARF) and Trulieve (CSE: TRUL) (OTC: TCNNF). Each of these companies, with the exception of MJardin, generated quarterly sales in excess of $10 million, with Trulieve, which leads all companies globally and saw growth in Florida alone of 739%, generating a profit. Several companies provided guidance for 2019, including Curaleaf ($400 million, with adjusted EBITDA of $100 million), KushCo Holdings ($110-120 million for its fiscal year ending 8/31) and Trulieve ($214 million with EBITDA of $92 million). In December, we will get a report from Cannex Capital (CSE: CNNX) (OTC: CNXXF), with very few reports expected until March otherwise. 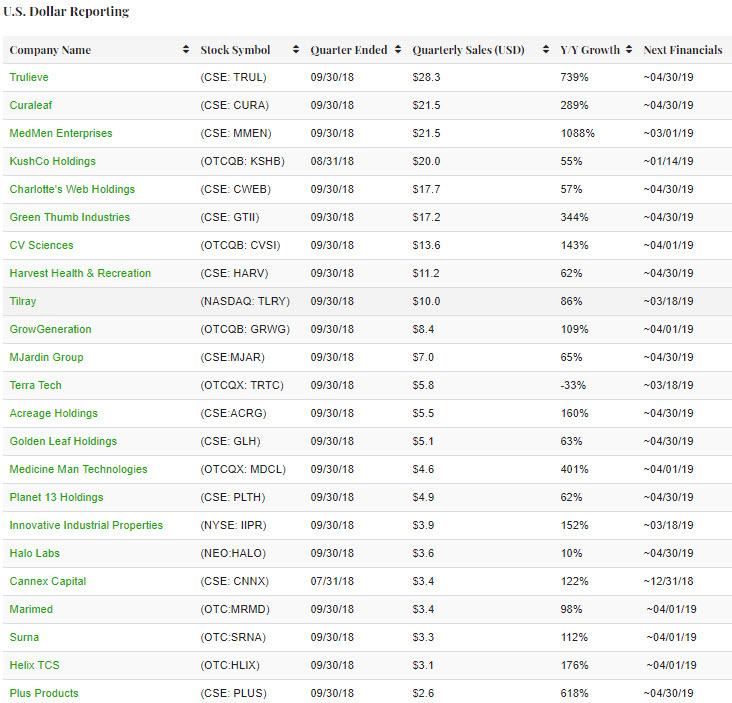 Of the companies that report in Canadian dollars, 1933 Industries (CSE: TGIF) (OTC: TGIFF) Isodiol International (CSE: ISOL) (OTC: ISOLF), MPX Bioceutical (CSE: MPX) (OTC: MPXEF), Origin House (CSE: OH) (OTC: ORHOF), which was formerly CannaRoyalty, and Sunniva (CSE: SNN) (OTC: SNNVF) all reported financials, with only MPX generating sales in excess of US$10 million. Both Isodiol and Sunniva saw sales decline from the prior quarter. Of the companies that report in Canadian dollars, we expect two will issue financial reports in December, including 1933 Industries, which will report its fiscal Q1, and Organigram (TSXV: OGI) (OTC: OGRMF), which will report its Q4 for the fiscal year ending August 31. 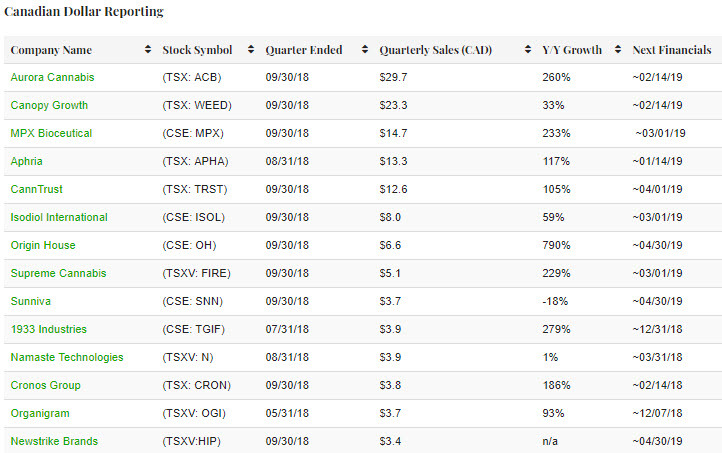 According to Sentieo, analysts expect Organigram generated Q4 sales of C$4.37 million, up from C$3.73 million in FY18-Q3 and up 103% from the same quarter a year ago. Visit the Public Cannabis Company Revenue Tracker to track and explore the complete list of qualifying companies.